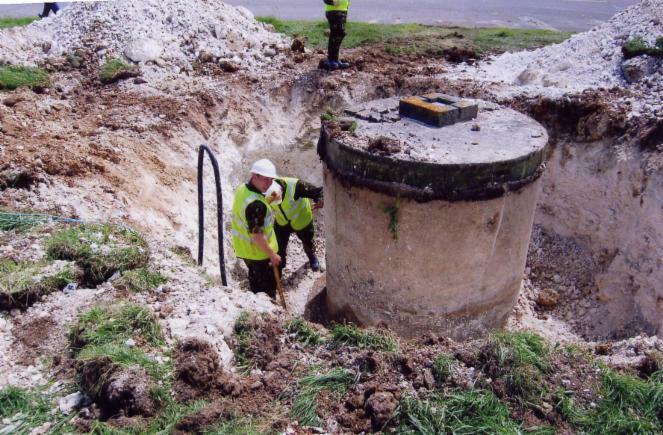 Having investigated and surveyed many Pickett Hamilton Forts over a number of years a fort at Kent International Airport (RAF Manston) was selected for recovery and preservation at the museum. The management of Kent International Airport kindly agreed to donate the fort to the museum and allow us to mount a recovery operation. Of the 300 plus forts constructed at almost every airfield in the UK, most of those that survive are flooded. The fort at Manston was dry and in superb condition in every respect and was thus worthy of saving. Officially known as the Pickett Hamilton Fort, it was more commonly known as a ‘Pop Up Pillbox’ and was designed to accommodate two or three men armed with rifles. Made of concrete, access was via a metal hatch on the top. The ‘pillbox’ was 9ft (2.7m) in diameter with a thickness of 9 to 10in (22 to 25cm). Buried into the ground, the fort consisted of two concrete cylinders: the outer attached to the base section and the inner, which formed the ‘pop up’ element. The inner section was actuated by a compressed air-driven jack. Because it was sometimes unreliable, the jack was backed up by an hydraulic ram worked manually by one of the occupants. This was accomplished by a double-acting pump mounted on top of a cylindrical oil reservoir, which enabled the fort to be raised in around eight seconds and lowered in 15 to 20. The main idea behind the forts was to maximise the element of surprise. At the start of any enemy attack on the airfield, they would rise out of the ground, with an all-round field of fire. With each fort costing approximately £240 to build, tenders were sent out to various companies for their construction. Most of the concrete work was carried out by DWG of Barnstable in Devon, while the original castings for the raising mechanism were produced by the Cornish firm Willey and Co. In the case of Manston and most of the Kent installations, Stanhay Ltd, Ashford based agricultural engineers, took on the work. Robin Brooks made an approach to the 36 Engineer Regiment of the Royal Engineers, based in nearby Maidstone, enquiring if they would like to treat the removal of the fort as an exercise. The idea was greeted very positively but duties in Iraq delayed the initial reconnaissance. Finally in March 2006 a group of engineers under the command of Staff Sgt Cumbers carried out a survey and considered the job both possible and worthwhile. Further stints in Iraq meant that it was mid-May before work could commence. The arrival of the Army and its heavy gear on May 18 saw work start on removing the topsoil, only to find that beneath it was a layer of pure chalk. Several hours into the operation revealed the sheer size of the fort and just how far it extended into the ground - it was around 10ft before the excavator reached the base. By midday the entire structure was uncovered to reveal a fort in very good condition with just one crack visible in the lower section. This first part of the job done, the Royal Engineers departed after placing a secure fence around the site. Rain prevented any further removal work until nine days later when, with fairer weather promised, Savage Cranes of Maidstone arrived to begin the final lift. After much discussion, it was decided to first attempt to lift the inner section out of its concrete sleeve. With the crane’s weight gauge registering 3 tons, the inner section was removed very slowly. As the gun slits became visible it also revealed, to the delight to all present, that the original wartime camouflage was still intact. Although the three little runner wheels were badly corroded and bent, the concrete was in excellent condition. Next to be lifted was the outer concrete barrel that was in two sections. This manoeuvre was successful, and left behind the base which contained the lifting equipment. Upon inspection the ramrod revealed a little brass plate containing an inscription: MADE UNDER SERIAL NO. 23 AND PRO PAT NOS. 5716/40 AND 5717/40. BRITISH PAT NO. 491130. Contact with the Patent Office brought the following comment: “improvements relating to the raising and lowering of agricultural implements”, the application being dated November 29, 1937. Lifting began at around 13:00 for the third and final part. Despite all the initial efforts, this section refused to move until shackles were placed around the ramrod itself and, with the crane registering 5 tons of pull, it reluctantly left its resting place of 65 years. 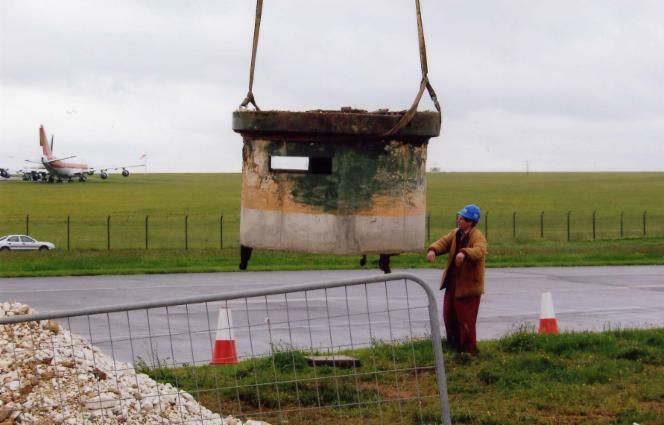 The sections were lifted onto a low loader and after 12 months of planning, possibly the only intact Pickett-Hamilton Fort left Manston for the Lashenden Air Warfare Museum. Whilst the lifting mechanism has seized up, initial cleaning has revealed that the oil in the vertical storage cylinder looked as good as new. The brass handle on top of the cylinder indicating RAISE-HOLD-LOWER is intact, together with the air bottle showing that it was inspected and possibly topped up in 1937 and 1939. These forts were never used in anger. For the men inside it must have been a most uncomfortable experience and very wet as drainage was minimal. To be effective, men would have to be in place in the claustrophobic cylinder before the arrival of an airborne invasion force in order to take the raiders by surprise. While in theory the idea was good, in practice the forts were virtually useless. They are however, a very good indication of the ingenuity and inventiveness of the wartime brain when it came to inventions. The restoration of the fort was undertaken by museum members David Wild and Barry Baker and over the next 18 months they stripped, rebuilt and refurbished the hydraulic mechanism to working order. They then reassembled everything within the fort, which was then put back together. The fort was originally intended to be buried on an airfield but it was felt that putting it back into the ground may degrade the concrete outer ring over time. It has therefore been sited at ground level and built up with earth and sandbags. An observation window as been cut into the concrete to enable visitors to view the internal workings of the fort. Whilst the original hand pump and gas bottle have been restored it has been decided not to use them on health & safety grounds, the fort is now raised and lowered by a power pack operated by a radio link to raise and lower the fort The fort is operated by a £1 slot machine which operates the fort. To the best of our knowledge this is the only complete, restored and working Pickett Hamilton Fort in the UK.